There have been eight congressional special elections since Donald Trump was inaugurated, and Republicans have won five of them. But the president spun that into a 5-0 record “up until last week” in a speech at a National Republican Congressional Committee dinner. Trump told his audience at the March 20 dinner that “we have to worry about ’18 before we worry about ’20.” He went on to describe an undefeated streak so far for the GOP. Trump, March 20: And the other thing is, you know, we had five races up until last week. And of the five races, we won all five. These people back here expected us to lose a couple of those races, maybe more than that. We won. They didn’t know what to do. So they said, “We didn’t win by as much as we were supposed to.” And, by the way, if we won by more, they would’ve found a reason. So we’re fighting the press, we’re fighting the media; we always will, for whatever reason. But we’re 5 and 0, and then we lost by 300 votes the other night, right? Three-hundred out of two-hundred-and-twenty-some-odd-thousand votes. Three-hundred votes. The president was speaking to the NRCC, which supports Republican candidates to the House. In his remarks, Trump counted only the House special elections in which the Republican candidate won to hold on to a Republican seat, ignoring that the Democrats held on to California’s 34th District. In the California race, two Democrats vied for the seat in a runoff after an open primary. Trump acknowledged the Republican loss last week in Pennsylvania’s 18th Congressional District, but he downplayed Conor Lamb’s upset over Rick Saccone as a mere 300-vote loss. It was a thin margin of victory, but Lamb is actually ahead by 627 in the unofficial results. Pittsburgh’s Tribune-Review reported that the lead was 758 votes as of March 20, as officials are sorting through provisional and other remaining ballots. In the past two House elections, the Republican ran unopposed in the district, which Trump won by nearly 20 points in the 2016 presidential election. Trump is also leaving out the one Senate special election — the Alabama race in which a Democrat, Doug Jones, won for the first time in 25 years, beating Republican Roy Moore. The two upset victories by the Democrats and the closer-than-expected losses in many of the other congressional races have prompted political prognosticators to reassess the political landscape for the 2018 midterm elections. In December, after Jones won in Alabama, FiveThirtyEight calculated what it called “partisan lean” — a measure of how a district or state would be expected to vote in a “neutral environment,” in which a presidential race would be a 50-50 tie between the two parties. 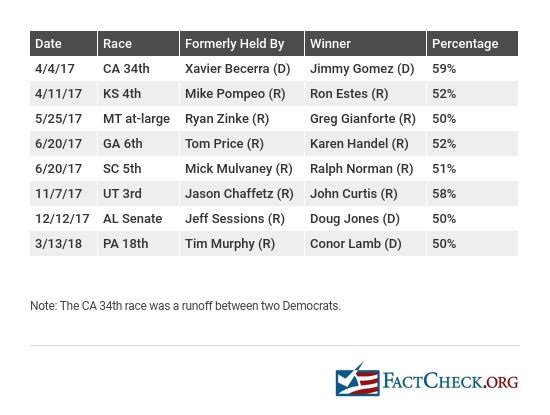 It found that in the 2017 special elections: “The Democrats have outperformed the partisan lean in all of them.” After Lamb’s upset in Pennsylvania, the Cook Political Report changed its ratings in 10 House races, giving the Democrats better odds of winning in nine of them. Below is the official scorecard for all eight of the congressional special elections so far. Of the seven House special elections in 2017 and 2018, the NRCC spent money in five of them, staying out of elections in Utah’s 3rd District, where Republican Rep. Jason Chaffetz’s seat was filled by Provo Mayor John Curtis, and California’s 34th District. So, the NRCC’s scorecard so far is 4-1 for the races to which it contributed. "We had five [congressional] races up until last week. And of the five races, we won all five."